Walk in wardrobes are more popular than ever, especially with women, because it is the ultimate way to organize your items and find them easily. Walk in wardrobes may have features such as shoe shelves, pull down hanging rails for maxi dresses, accessory drawers, LED lights etc. 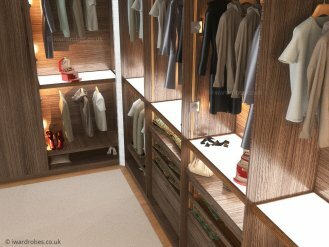 Many of us have more than 10 pairs of shoes, so the fitted bespoke shoe storage often is very an important part of the walk in wardrobe. Another popular requirement for the walk-in closet is a floor to ceiling hanging space for dresses, coats, etc. To maximize the hanging space the pull-down hanging rail can be used in case of a high ceiling or just if very long items need to be kept. Fitted shelves for keeping bags, tie racks and accessory drawers is also a much demanded part of a walk-in wardrobe. In the majority of cases customers prefer to divide a walk-in wardrobe in hers and his parts. It can be done not only by just creating parts of the unit according his and hers requirements, but also visually – by using different material colours and structures. Many customers take a bespoke walk-in wardrobe not only as a fitted storage space, but also as an interior feature in their home. This is one of the reasons why the choice of the design, materials and structures is taken seriously and a customer might need some time to make a final decision. Our designers are here for you to answer your questions and to give some ideas. Feel free to contact us via info@i-wardrobes.co.uk or call 020 3561 0820 to book a free designers visit.